Farmers Markets in Wichita and surrounding communities abound with locally grown fresh food, plants, honey, handmade items, and more. 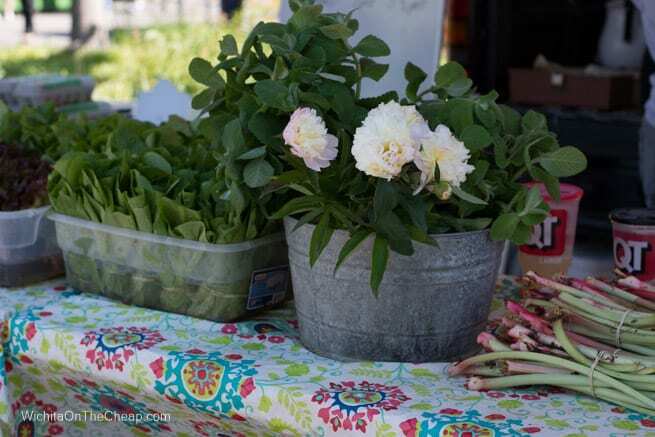 Some markets offer kids activities and live entertainment; all offer a great opportunity to meet your neighbors, learn more about local produce, and share in the fun of discovering things produced right here in our own state by talented Kansans! I’ve divided them up by day of the week, so as you scroll you’ll see Farmers Markets on Saturdays, Tuesdays, Wednesdays, and Thursdays. A few markets can be difficult to get information about so if you know something I don’t, please do share. I’ll update my list so that readers will know about all the wonderful local farmers markets available in our area! Do you know of a Wichita-area farmers market we should include in our list? Tell us about it! Outdoor summer market with fresh fruits and veggies, handmade items, baked goods, other vendors and occasional live music. Nice drive in the country; 15 minutes north of Wichita. Double-check the schedule at the link below before you make the drive. Expected Dates: June 8, 22; July 6, 20; August 3, 17, 31. You won’t have to wake with the roosters to shop at this market. Stop by on Tuesday evenings to pick up some produce and enjoy special events that are held from time to time by Green Acres. This downtown market was new last year. Pick up fresh produce and handmade local goods during your lunch break. Walk from work or use metered parking on English Street or across the street in the Century II parking lot. Fresh produce, farmers’ goods, and canned goods. Address: 1423 N. Webb Rd. Fresh produce and local food trucks onsite, healthy cooking demos, etc. The VA Farmers Market is free and open to the public. Thanks so much for having the Farmers Market listings with start dates! It’s usually hard to find those dates. And the info on the Little Zoo event — couldn’t find that anywhere else! You’re welcome, Terry! I’m so glad it’s useful! !